Trucker Jack Burton accompanies his friend Wang to the airport to pick up Wang’s fiancee arriving from China. While waiting, Jack attempts to chat up Gracie Law, who is waiting for another woman from China. A Chinese street gang attempting to kidnap Gracie’s friend for a quick sale gets foiled by Jack’s intervention, so they grab Wang’s fiancee instead. 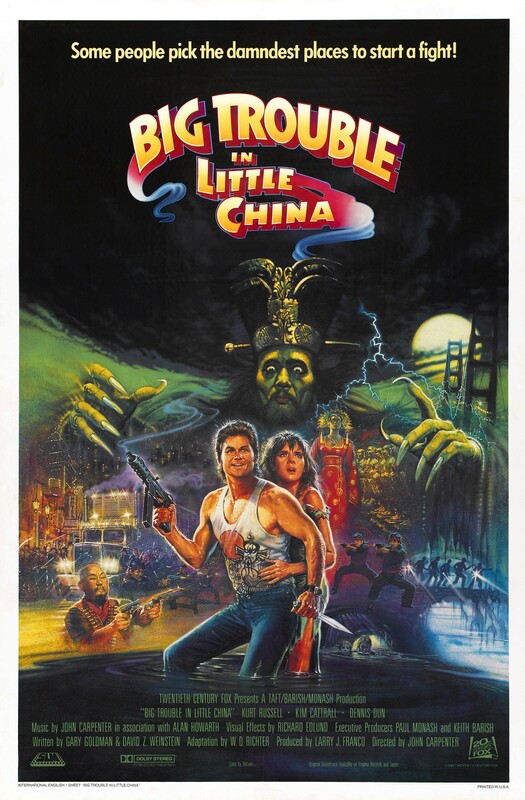 Taking off after them in Jack’s truck, Jack and Wang find themselves in the middle of a Chinatown gang war that gets a triad of wizard warriors and the legendary sorcerer Lo Pan involved. They flee and Jack’s truck gets stolen. Later, while trying to rescue Wang’s fiancee from the brothel she’s held at, Lo Pan’s minions take her first. Lo Pan has been living for centuries with a curse that can only be lifted if he marries a girl with green eyes, which is exceedingly rare in China, but now with Wang’s fiancee, he can return to his full strength and then dispose of her. Jack and Wang now have to fight through the might of the spirit realm, and Jack just wants his truck back. There are all sorts of stories that thrust random unfit people into adventure. Usually they either struggle to become fit for the adventure or just quickly and quietly become experts at the skills they need for the task with no explanation. The only story I can think of that comes close to how well this movie portrays Jack as being the wrong man for the job is The Hunt for Red October‘s decent work making Jack Ryan a desk jockey with no business stepping into the action. Jack Burton is mouthy and stubborn, and not much else, and by the end of the movie, he’s mouthy and stubborn and not much else. He’s constantly needing the mysticism around him explained to him, and he’s not much use in a fight. He’s decent with a gun, perhaps better than I’d just assume a trucker to naturally be, but guns are useless against the magical beings he’s up against. Multiple times, fighting Jack’s way gets him sidelined while Wang and his friends get things done. And it’s actually quite frustrating. With Jack not contributing much of anything and no stakes to be risking his life for, I want him to either take the reins or get out of Wang and Egg’s way. All three of the white characters were pretty much just dead weight. I don’t expect this movie to be an accurate portrayal of Chinese mythos. I’m not sure if there’s even enough actual mythology in the mix to apply Egg’s line about religion in China, “we take what we want and leave the rest, just like your salad bar” to it. But Lo Pan is just a dreadful caricature of dark Chinese mysticism in his spirit form. James Hong makes him fun to watch in his frail human form, but there’s no saving his true form. It’s just embarrassing. In terms of just characters, Gracie and her journalist friend Margo could be pretty decent. They could probably carry their own movie. But their function in the plot is barely any more than Wang’s fiancee Miao Yin, whom I don’t remember actually getting a chance to speak for herself in the entire movie between being kidnapped straight off the plane, bound and gagged, and forced into a mystical trance. Miao is more of a prop than a damsel in distress. The only women who don’t spend at least some of the movie being treated as property are running a brothel, and no one even acknowledges that’s generally not a good thing, just that it’s not a good thing for the women they care about, who are already their property. The 80s should have had a higher standard than that. I actually did enjoy a lot of this movie, but I had to work at ignoring all of the above to do so. I appreciated the spirit of the East meets West concept even if West just bumbled through and had to have everything explained. The magical elements were interesting, but would have been more fun if they weren’t based on a bad understanding of somebody else’s culture. There are good ideas in here, but I’m not sure if they could be salvaged in something that much resembled this.